We have a double dose of trip reports for everyone today! The Duo went to Sea World San Diego to check out their brand new area Ocean Explorer, rode its main attraction Submarine Quest, saw the BRAND NEW Orca Encounter show, got a back stage tour with a close encounter with a Dolphin and Sea Lion, and rose their big rides Manta (roller coaster) and Journey to Atlantis! In The Duo’s second trip, they visited Disney California Adventure park to ride Guardians of the Galaxy Mission: Breakout for the first time. Hear their thoughts and problems with the fun new additions to Hollywood Land at The Disneyland Resort. 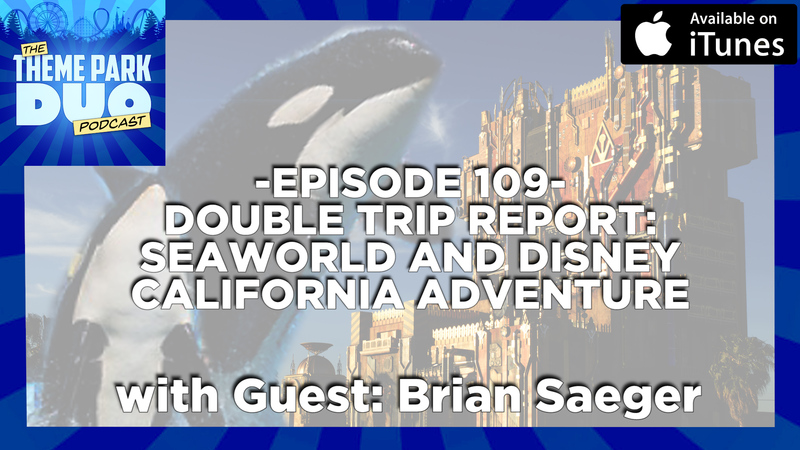 Also on this episode, The Duo is joined by Brian Saeger of skywalkingadventure.com to chat about the theme park news! They chat about Universal Studios and their announcement of Super Nintendo World, Universal Studios Hollywood getting a Voodoo Donuts, Universal Studios Hollywood’s new DreamWorks Theatre attraction replacing Shrek 4D, as well as a Haunting Headlines segment about American Horror Story Roanoke coming to Halloween Horror Nights Hollywood! Oh and we breifly chat about the incident at Walt Disney World with the Monorail piece flying off near guests at EPCOT! It’s a packed episode, so buckle up tight because this is going to get crazy!